Deep red, earthy, sweet, slightly smoky northern New Mexico red chile powder provides the amazing complexity in this Instant Pot Red Chile Posole. It can be on your table in about an hour, but tastes like it cooked for hours! This recipe first appeared on Pressure Cooking Today where I am a monthly contributor. Red chile varies both in heat level and flavor depending upon the region in which it grows, and whether it is oven dried or sun dried. 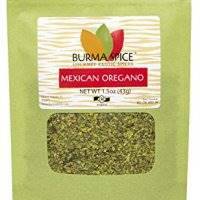 Perhaps you’ve seen the little packets of red chile powder in the Mexican foods section of your local market? The color may not be the intense reddish-brown color of the sun-dried red chile from northern New Mexico, but will still have plenty of flavor. I do my best to keep red chile from northern New Mexico in a vacuum-sealed jar in my pantry! The chile culture in that part of the state is really interesting. The locals can taste a dish made with red chile and tell you whether it came from Chimayo or Dixon! My palate is not quite that well-developed. Lol. However, I can tell the difference between northern and southern New Mexico red chile. For more on red chile, see this article. I have made this dish on my gas stove, in a slow cooker, and in a pressure cooker. I prefer the results obtained using the pressure cooker. The cubed pork gets tender in a fraction of the time, and it’s easy to control the texture of the hominy. I do this in 2 steps: First, I pressurize the frozen posole (hominy) in a generous amount water for about 15 minutes. After a quick pressure release, drain the posole, and set it aside. 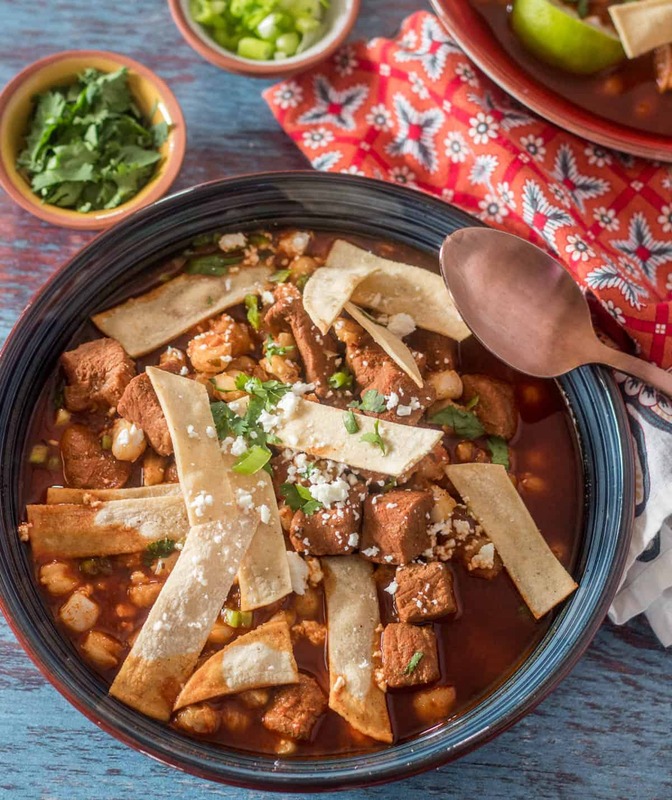 Note: Posole is both an ingredient and a dish. The photo at the left is an example of a widely available brand. Rinse and dry the inside of the pressure cooker. Add a bit of oil to the pot. Cook the cubed pork, garlic, and onion on medium-high heat if using a stove top model, and on the sauté setting if using an Instant Pot or similar. Cook until the pork is browned, and onions are soft. Add the cumin, Mexican oregano, bay leaves, broth and red chile, and beer (optional). Lock the lid, and cook on high on the “stew” setting (about 20 minutes in your cook top model). After releasing the pressure, add the posole/hominy back into the pressure cooker, and stir to combine and heat through. Serve with your preferred garnishes and enjoy! Deep red, earthy, sweet, slightly smoky northern New Mexico red chile powder provides the amazing complexity in this Instant Pot Red Chile Posole. It can be on your table in about an hour, but tastes like it cooked for hours! Add the posole to the pot. Cover with water to the "maximum" line. Pressure cook on "beans" setting medium (about 15 minutes) or about 15 minutes if doing it on the cook top. Do a natural release for about 5 minutes, then release the pressure. Drain posole, and set aside. It should be tender but firm. Brown pork cubes with chopped onion, garlic, and cumin on the saute or browning setting (medium-high on cook top). Whisk red chile powder into the chicken broth/stock. Add to the pot along with the beer (if using), Mexican oregano, bay leaves, salt, and pepper. Note: This amount goes right to the maximum fill line of my 6 quart pressure cooker. Set to the "stew" setting or on the cook top for about 20 minutes. While the pork cooks, prepare the garnishes. Do a natural pressure release. Add the posole into the pot with the tender pork. Stir to combine. Ladle the posole into bowls, and top with preferred garnishes. Beer is not gluten free! It is optional, and easily omitted. I only add it if I have beer on hand. 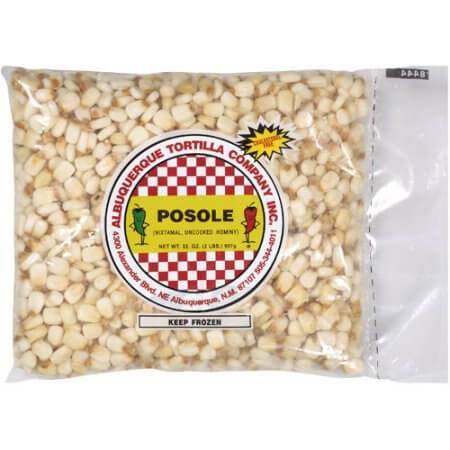 If you can't find the frozen posole, you can substitute canned hominy. The texture is less firm, and you will not pressure cook the canned hominy! Add it in after the pork is cooked, allowing enough time in the pot for it to heat through. Dried hominy is another option. It will require a pre-soak before cooking. This makes a large pot of posole, and leftovers freeze well. The posole will continue to absorb liquid, but you can add some broth or stock to the pot when you thaw and reheat it. 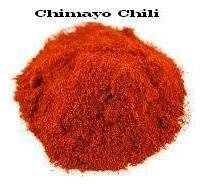 New Mexico red chile powder varies in heat level. If it's not marked, it's probably considered "medium." On a stovetop model, bring it to pressure on high, and then reduce heat to medium to keep the pressure. I can't wait to try this recipe. I searched and happen to find your recipe on Pressure Cooking Today. I grew up eating posole for Christmas or before Christmas. My mom who is from New Mexico would make tamales and with the extra meat would make posole. Usually in the jumbo enamel pot on the stove, so she could have extra to freeze. I have a pork roast thawing, cans of hominy, red and green chile. I plan on making both this weekend. But was stumped on when to put in the hominy. So thanks! PS I really miss the frozen hominy. You can't find that here in the midwest. Thanks for sharing this with me! I miss the tamale making with my kids - we did them for special occasions! The main thing to remember with the canned hominy is to minimize the cooking time. If you don't plan to use a pressure cooker, I have a "regular" recipe on my blog as well! Merry Christmas! I love this recipe and I have to say that I do like the red but I am officially a green girl. It just seems to have more zest to it! This is perfect comfort food. Haha Jennifer! Thanks for weighing in on such an important question :-) Yes, posose - either red or green - is a perfect comfort food! Christmas Eve, our comfort food will be menudo. I'm curious how my readers feel about that one! I've got several recipes that I use the chili word in all different spellings..... the one thing that I can agree on is they are great in anything! 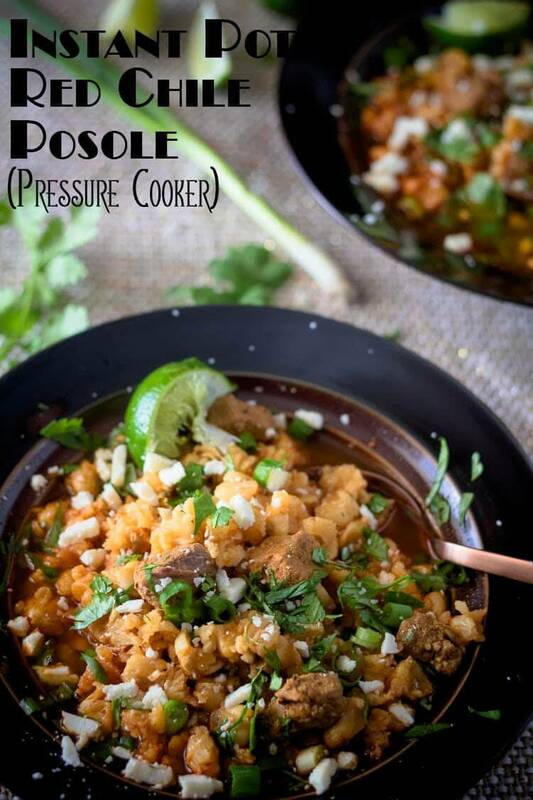 Posole is one of my favorite dishes.... this is a little different than how I season mine.... can't wait to try it! Yay for hubbies that cook! I love my pressure cooker, but I grew up with a mom using one regularly. The old ones were way scarier! I like a bit of food trivia. I also like the sound of your chile posole - it looks colourful and deeply comforting. I'd say it's definitely southwest comfort food Jane! You will rarely find a New Mexican that doesn't crave it - especially in the winter! There seems to be a lot of spelling variations of chili - in the UK we seem to spell it with two L's! This looks super delicious! I've never used a pressure cooker before, they seem a bit scary but I want one! Chile, chili, chilli! It's all good ;-) You should get a pressure cooker Michelle... I have found they're at least as useful (if not more so) to busy cooks than a slow cooker! What a beautiful recipe! 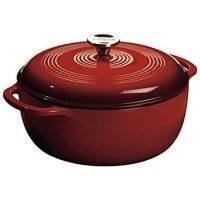 I love cooking with chile but am not experienced with pressure cookers ever since I was told if I ran throiugh the kitchen when one was on the stove it would explode. I need therapy because of it I think. Haha Julie! I grew up quite afraid of my mom's pressure cooker ;-) The modern ones are so safe, though. I have both stove top and electric models, and I am more likely to use them than my slow cooker for similar dishes because I don't plan well enough to get the slow cooker going in the morning.